Step back in time to when Christmas Day was only the beginning of the season! 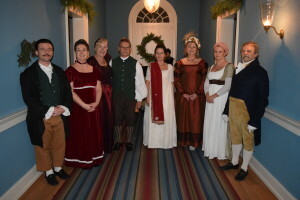 Learn about 18th-century Yuletide traditions and customs. Beautiful music will fill the air, and dancing will take place in the first floor hallway. Bring your friends, family, and guests to celebrate the season during this popular annual event! $10 for adults, $8 for seniors (65+) and children 6-12, and free for children under 6. No reservations required.